More lovely linen shades?!? Well, cotton anyway. 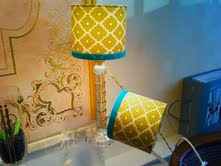 Super hot print by Schumacher, Ziggurat, with turquoise trim- these two sconce shades of Kristin's look so very summery and bright. Enjoy.